WARNING: certain storylines lead to canon-typical violence or major character death. If this is a problem for you, feel free to ask about 'safe choices' or avoid this! Please be aware that the actual pages themselves are hosted on an external site. Constructive criticism is welcomed with gratitude! There are a lot of fiddly files here, and I'd appreciate knowing if I've broken something. Original Choose Your Own Adventure audiobook by Sidney Sussex. Thank you so much for letting us record your amazing story! We had a ton of fun. Cover art by Tigs (AO3, photobucket). Isn't it just absolutely flawless? Click on the cover or click here to begin! downloading the podbook (created by the marvelous regonym, 3:28:25, 207 MB). [Psst: First of all, I'd like to sincerely apologize to the poor Audiofic Archive archivist that gets stuck with this job. Feel free to contact me at Hananobira @ Gmail if you have any questions. I sat two non-fannish friends down at the microphone and forced them to podfic with us, so they won't have tags. Can I have two created for 'reader:Brandy' and 'reader: Jennifer Hunt', please? Music: Kevin McLeod (incompetech.com): "March of the Mind," "Dragon and Toast," "Arcadia," and "Mind Scrape." Summary: Cecil hasn’t left the studio in seventeen years. 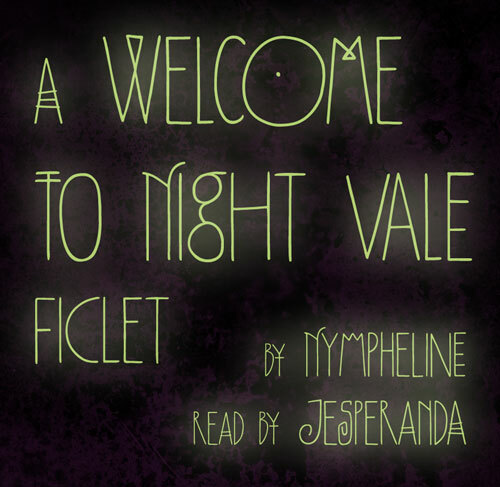 Reader's Notes: Nympheline's writing is always captivating, but this piece inspired me to put on my best Cecil-drone and record it. It hints at the inverse of "I have no mouth, and I must scream." Fun facts: This is the first time I've used music in a podfic, and the first podfic I've recorded that isn't in a British fandom (gasp!). Fonts used for the covers are Cinecav X (left) and Polygraph (right). I loved the strangeness of Polygraph (and it gets stranger), but I decided the main cover should look more like the studio prompter. Both covers are included in the sound files, or click for a full-size version. 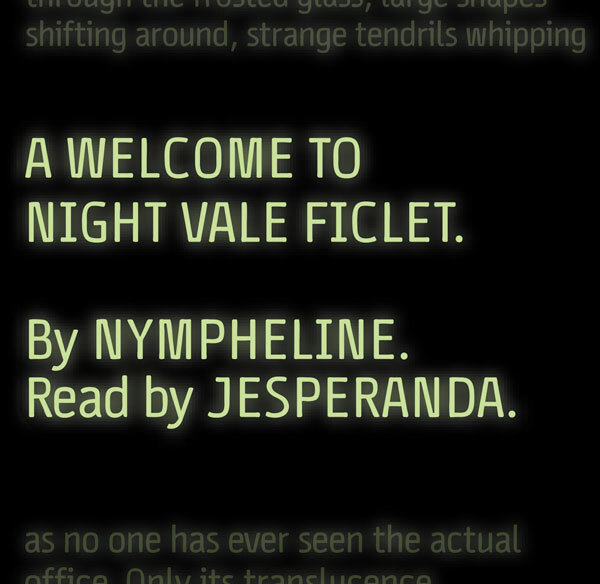 Many thanks to Nympheline for her gracious permission; to the creators of Welcome to Night Vale for such a quirky little 'verse; and to paraka for the hosting. Crossposted to Tumblr, AO3, and LiveJournal.